Andrew Elick Huff was born on June 14, 1894 in Methow, Okanogan County, Washington. 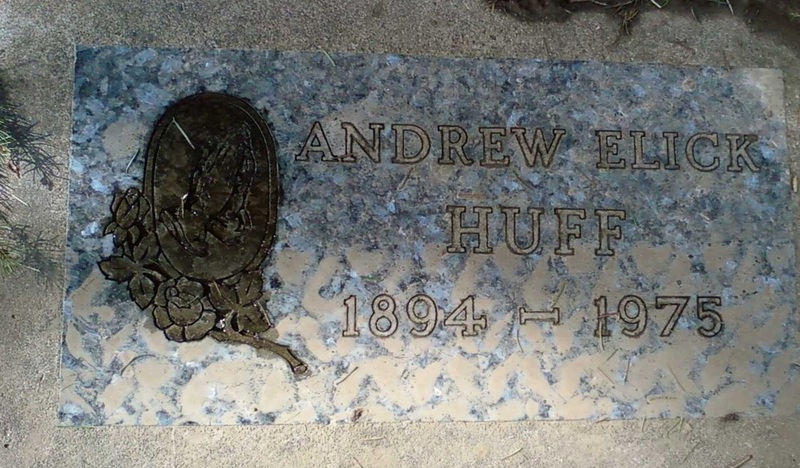 He was the sixth child of twelve born to Andrew and Agnes Flora Huff. Andrew Huff made his living as a hired hand. The family lived in a covered wagon traveling to where work was to be found. In 1906 after the Great San Francisco Earthquake, the family traveled to San Francisco to help with the rebuilding of the city. On October 6th Agnes gave birth to her twelfth child, a son, Rufus. Sadly, Rufus died the same day. The family, unnerved by the continued tremors, returned to Northeast Oregon. In 1913 Elick met Marguerite Delphine Nibler. Before Del's grandmother Catherine would permit them to marry, Elick had to learn a trade because there was no way she would allow her granddaughter to marry a "saddle tramp." Catherine financed Elick's training to become a house painter. Elick and Del were married on June 1, 1913 in a civil ceremony by the Walla Walla County Justice of the Peace. Then on June 3, 1913 they were married in the Catholic Church. In 1915, Elick and Del welcomed the first of what would be ten children with the birth of their daughter Frances Catherine. Elick, accustomed to moving often, found it hard to settle in one place for very long. Every few months, he would move the family from one house to the next. However, around 1920, he and Del acquired 160 acres in the Blue Mountains near Heppner, Oregon through the Homestead Act. They lived on the property off and on for the next twenty years. In July of 1924 Elick and Del's four children - Frances, Albert, Helen and Theresa - became ill with what the local newspaper called food poisoning. The three older children recovered. Sadly, Theresa died in Elick's arms on July 18th. 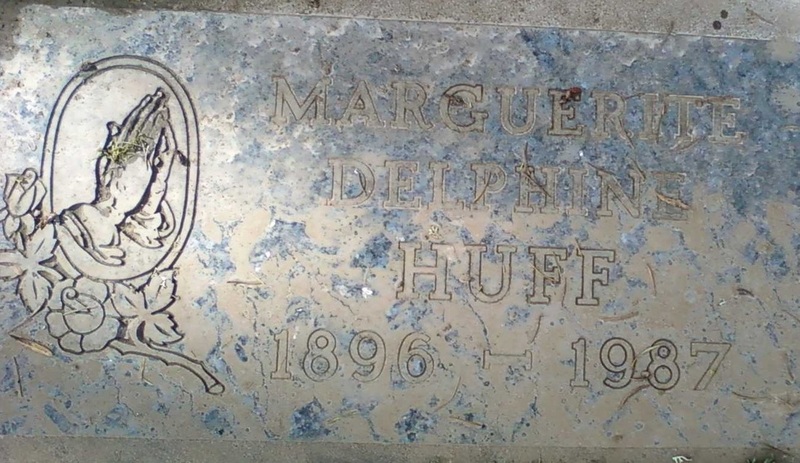 She was buried in the Heppner Cemetery. In the course of his working with paints, Elick became ill three times with lead poisoning. Once time it was so severe that Elick's brother Emmett took him to Pendleton to see the doctor. The doctor told Emmett that Elick wouldn't survive. Emmett begged the doctor to treat him anyway. The doctor relented and treated Elick but refused any payment. Emmett took Elick back home where he recovered. In the late 1930's Elick moved his family west to Portland where they lived with his eldest sister Ginnettie. After Del and Ginnettie got into a fight (Ginnettie throwing dinner plates at Del and Del punching Ginnettie), Del told Elick she was taking the children and leaving. He was free to come with them if he chose. Elick did and moved the family to Tobias, Oregon and then to Hillsboro. In the mid-40's they purchased a farmhouse on eleven acre strip of land behind Shute Park in Hillsboro, Oregon. There the family finally settled. Del raised chickens and Elick had his horses and cows. Over the years, the family continued to make annual trips to the homestead in Heppner for the deer hunting and elk hunting seasons. On June 2, 1963, Elick and Del celebrated their 50th wedding anniversary at the home of their daughter, Agnes. Their daughter-in-law Kathleen made their cake. On August 1, 1970, tragedy struck the family again. Frances Catherine suffered a heart attack and died. By this time, Elick was already showing signs of dementia. His condition worsened until on June 2, 1975, after suffering a stroke, he came home to his son John's house to spend the rest of his days. On September 27, 1975, Elick slipped into a coma and passed away. He was buried in Fir Lawn Cemetery in Hillsboro, Oregon. Marguerite Delphine Nibler was born on February 29th, 1896 in Walla Walla, Washington. She was the second of six children born to Francis and Mabel Nibler. Sadly her only brother, Francis Z Nibler, died from cerebral meningitis on May 25, 1901 at only six months. Her sister Theressa Anabel died March 29, 1904 from meningitis at age seven months. The family was dealt another blow when on January 8, 1905, her father Francis (Frank) Nibler suffered an asthma attack and died. He was 39. After the death of her father, Del's maternal grandmother Catherine LeRoux took over the financial support and care of the family. By 1910 Del's mother Mabel married a man by the name of W J Carrol. In 1913, Del met Elick Huff and the two wanted to marry. However, there was no way Catherine would allow Del to marry a "saddle tramp". So, before she would give her consent, Elick had to learn a trade. Catherine financed his training to become a house painter. On June 1, 1913, the couple were married by the Justice of the Peace in Walla Walla, Washington. On June 3, 1913 they were married in the Catholic church. In 1915 sadness struck again when Mabel succumbed to cancer and died. In May of 1915, Elick and Del welcomed their child, Frances Catherine Huff. Over the next 20 years, they would go on to have nine more children. The early years were rough for the family. Elick, used to moving around, moved his family from house to house around Northeast Oregon and Southeast Washington. By 1920 the couple acquired 160 acres in Heppner, Oregon through the Homestead Act. They moved a small cabin onto "the Flat" where they lived from time to time. It was during one of those times, in the summer of 1924, their four children (Frances, Albert, Helen and Theresa) became ill with what the newspapers called food poisoning. Sadly, Theresa, barely 2 years old, died in Elick's arms. In the late 1930's, Elick moved his family west to Portland. They stayed with his eldest sister, Ginnettie. Del and Ginnettie clashed and Del gave Elick an ultimatum. He could either stay with his sister or leave with her and their children. He went with them, moving the family to Tobias. From there they moved to Hillsboro. In the mid-40's they purchased an eleven acre strip of land behind Shute Park. The family was through moving. In 1963, Elick and Del celebrated their 50th wedding anniversary by renewing their wedding vows at St. Matthew's Catholic Church. On August 1, 1970, Del and Elick's eldest child, Frances, suffered a heart attack and died. Five years later, on September 27, 1975, Elick passed away at the age of 81 at the home of their son, John. He was buried at Fir Lawn Cemetery near his daughter Francis. In the summer of 1980, Delphine moved in with her son, John, just down the road from her house on 8th St.
On May 4, 1987, Delphine passed away in her sleep at the age of 91. She was buried next to her husband at Fir Lawn Cemetery in Hillsboro, Oregon.